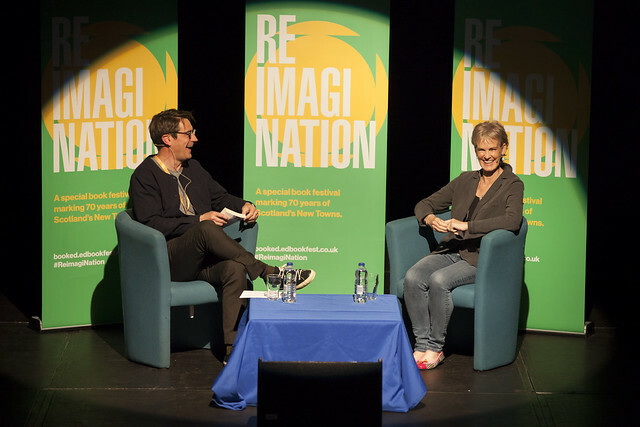 We were thrilled to welcome thousands of people to the Rothes Halls last week for ReimagiNation: Glenrothes, a three-day festival filled with events for adults, families and school pupils. The venue was buzzing from the first minute to the last with enthusiastic audiences meeting fantastic writers, broadcasters and performers, while pop-up art activities and exhibitions allowed everyone to take part in the festival, reflect on the history of Fife’s New Town in its 70th anniversary year, and make their voices heard as we considered the future of Glenrothes. See our news article on edbookfest.co.uk for a round-up of the festival. We owe a massive thanks to our event partner Fife Cultural Trust and the wonderful staff of the Rothes Halls who helped us deliver such a successful event. We also relied on the support of the Kingdom Shopping Centre, Waterstones stores in both Kirkcaldy and St Andrews, the Wellcome Trust, and players of the People’s Postcode Lottery, who enable all our work on the road around Scotland. A generous benefactor of the Book Festival provided every pupil attending our schools programme with a free book, helping us nurture a love of reading in over 2000 Fife school pupils. Finally our thanks to the authors, performers and participants who took part, and to everyone who attended and made it a special three days on the road for the Book Festival.